Magnification, intensification, sealing of spells or intentions, gridding, and holding sacred space. These are just some of the amazing things you can do with these included Harlequin quartz generators. 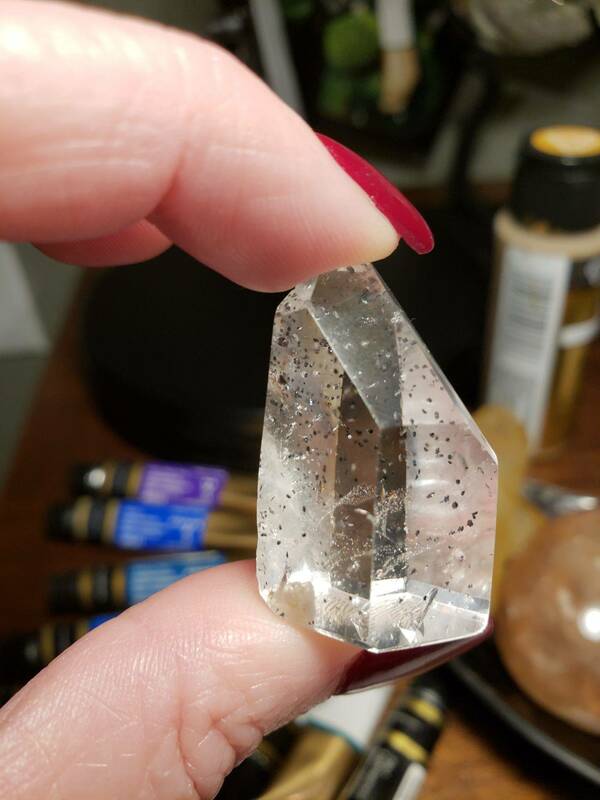 A rare phenomenon of crystal growth, this material grows exclusively in Madagascar and the inclusions inside are a powerhouse healing blend of Hematite for grounding and protection, Titanium for stabililty and strength, and Lepidochrosite for physical healing and cellular regeneration. If you are recovering from anything – heartache or heart break to surgery or illness – this will carry you through. I just wish I had more! I collect Harlequin quartz because it’s rare and gorgeous and has such potent healing properties. You know if I collect it, it has to be good! WHY WORK WITH A GENERATOR? A generator is an important gemstone tool in any metaphysical practice, and a major conduit of our spiritual work. Flat at the base and faceted around the sides, generators taper toward a pointed top. 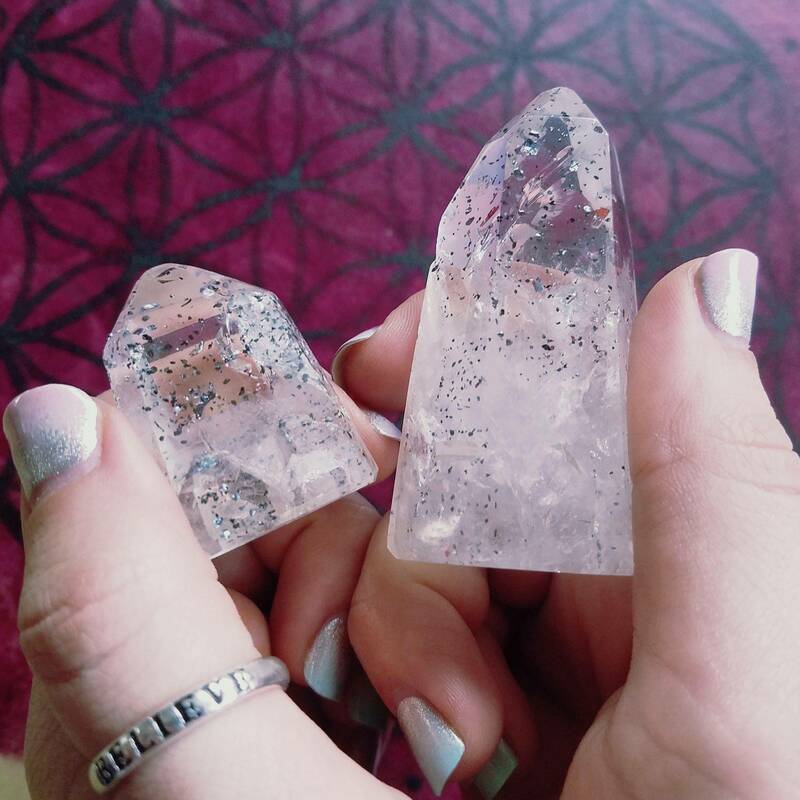 These towers of energetic potential can be large or small, and can be carved from any crystal or stone specimen, although clear quartz is the go-to generator for both novice and advanced energy workers. As energy flows skyward, a feedback loop forms, through which the energy is raised, directed, and then returns into the Earth, up through the flat bottom of the generator, and back skyward again. When you work with a generator, you are working with a mini vortex high vibe magic. Generators are the tool to use for two main practices: charging your other stones with their energy and for gridding. Essentially, these two are one and the same, but the latter is done with an intention, and often involves a meditation or a prayer. Ultimately, what you want to do with your generator is focus on a very specific intention. As you do this, envision the Earth’s resources, vitality, and strength being pulled into the generator’s flat bottom and collecting at the base. Then, envision these energies drawing upward, out through the point at the top, and connecting to the energy of Source. This listing is for one (1) Harlequin included quartz generator. I have two sizes to offer you. Medium is about 1.25-2”, and large is about 2-3”. Use the drop down menu to choose the size which you feel called to and we will choose a unique generator for you. Yours will arrive lovingly parceled for your enjoyment and delight. I like a big rock, but honestly this generator is so powerful! I opened it and just sat with it at my heart for 30 minutes and felt so much relief and connection. I haven’t even gridded with it yet and it was just so perfect! I Love Harlequin quartz and this is a wonderful piece. Hundreds of glittering little Sparks of magic in this piece. I bought as part of a Christmas gift. Ha! This maybe hard to part with. Couldnt pick them up with photo, but its loaded with glitter.